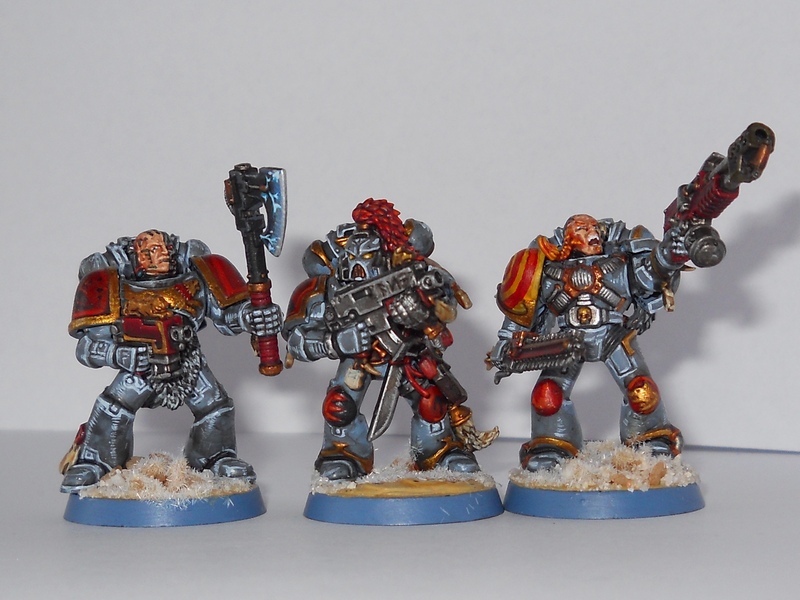 Space Wolf Panorama: A mixture of models from my newest to some of my oldest. 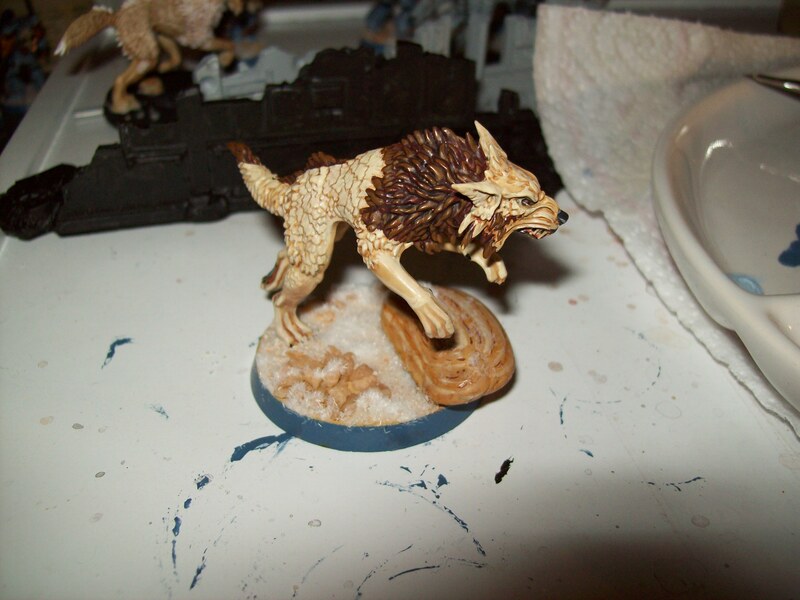 So, after all the preamble in the previous post, here’s how I paint my Wolves. The colour key is in the previous post. 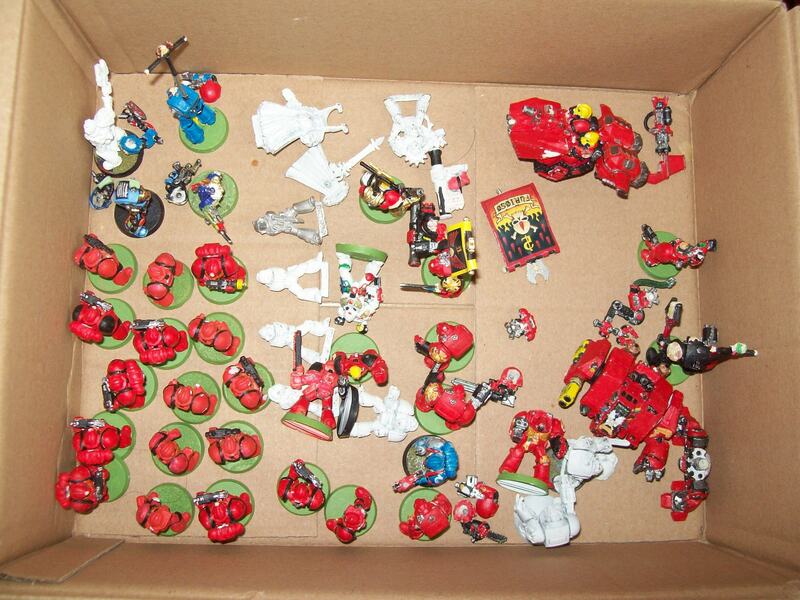 I start by painting the armour SW Mix. The concertinaed areas at the back of the knees, thigh joints etc. are coloured Eshin Grey. 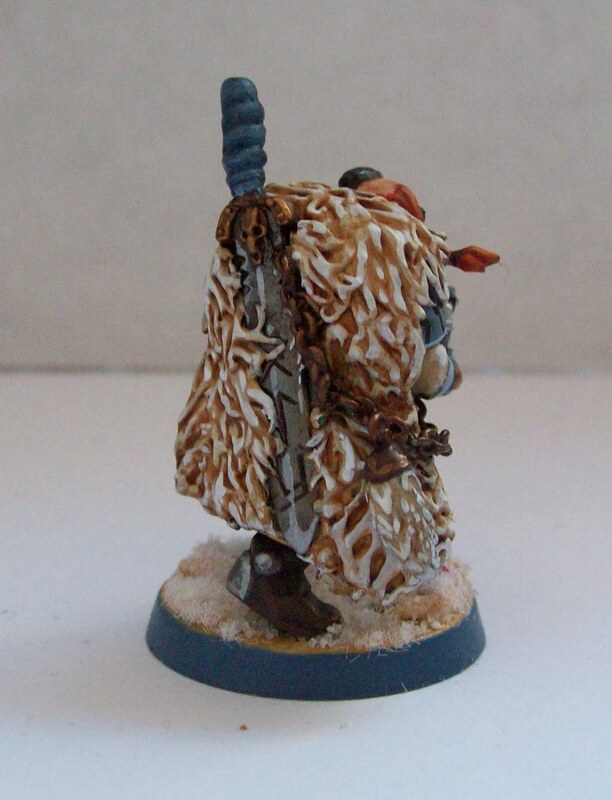 Bare skin and the backside of furs are painted Bugman’s Glow. 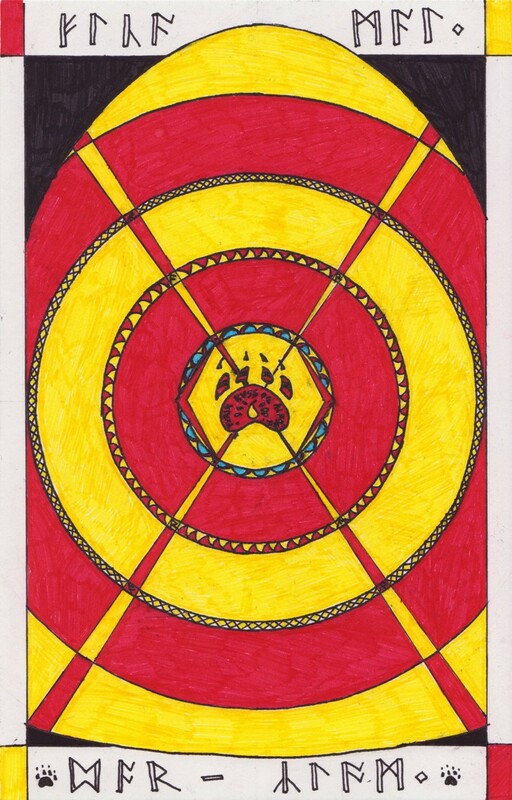 Areas that will be painted gold or brass are painted with Tausept Ochre, yellow areas are painted with Iyanden Darksun and red areas are painted Mechrite Red. Bone areas (skulls, fangs, purity seals) are undercoated Ceramite White. Leather areas are painted Scorched Brown. My cabling colour scheme doesn’t completely work with the new paints as they got rid of Mechrite Red and I use that along with Fenris Grey and Caliban Green for any piping. Silver areas are painted with Boltgun Metal. Skin is painted with Elf Flesh, red areas painted with Red Gore (weapon grips, purity seals, fabric/chords) or Blood Red (armour), yellow areas are painted with Yriel Yellow. For yellows you need to do several thin coats in order to get a smooth colour. Brass areas are painted with Dwarf Bronze and gold areas are painted Shining Gold. For large bits of freehand I really recommend planning in advance (shoulder pads for instance). 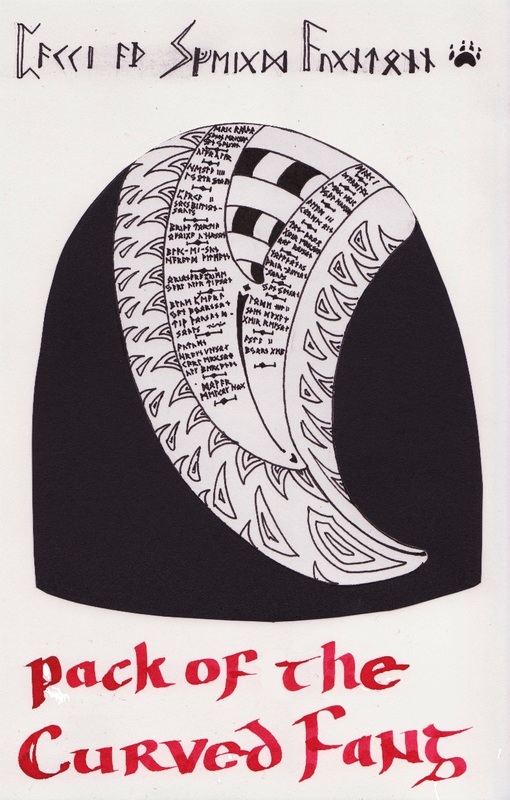 For tattoos I tend to go with the flow and see what I can come up with. I like to paint freehand before highlighting as it is easier to correct mistakes. However, this can also disrupt the highlighting process a little as you have to paint round the details. The new washes tend to stick a bit more to the models. I don’t mind this so much as it makes armour in particular a little bit dark and dirty. If you want to dilute it use a bit of Lahmian Medium as well as water as that improves the flow a bit. For armour I start with a layer of Deneb Mud and then follow it up with a layer of Badab Black. 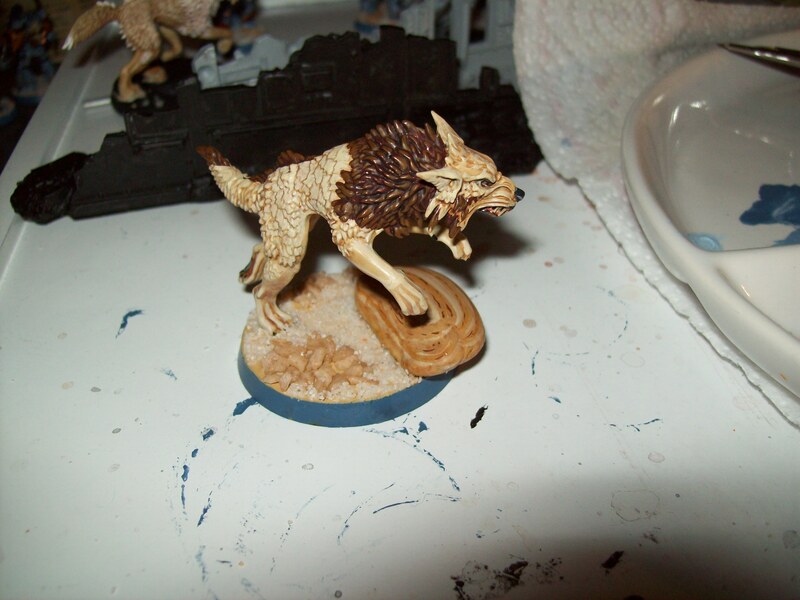 Oddly enough, I don’t highlight my Wolves quite as much or use such a complicated scheme as I use for my newer models. It’s mostly because I’m trying to have a vaguely coherent army and I started highlighting with my second set of guys and while I hope that my technique has evolved, I’d like to have an army that more or less looks the same. 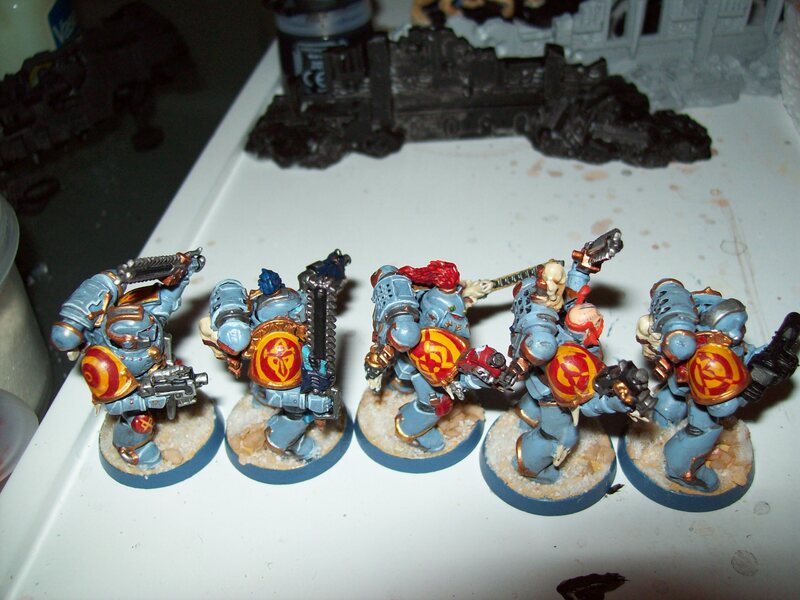 For armour I highlight with Space Wolves Grey. I line highlight along any edges and panelling and then add other highlights where it looks like light will fall. 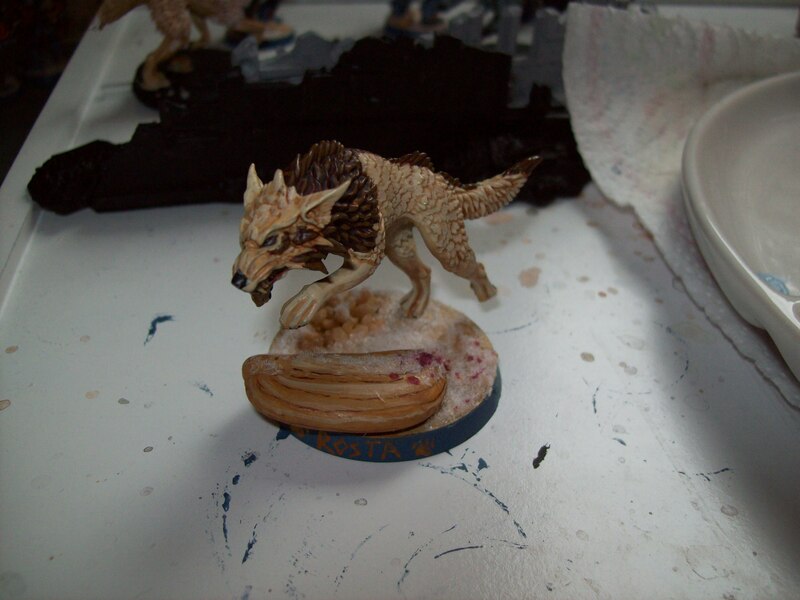 For bone areas I start with Bleached Bone (the Gryphonne Sepia really does change the colour that much!) and then extreme highlight with a touch of skull white. Yellow areas are highlighted with YY+W while red areas are highlighted up in the order (BR+RG, Blood Red,) TSO+BR, Troll Slayer Orange. Brass areas are highlighted with shining gold, while golden areas are highlighted with Burnished Gold. Silvery coloured metals are highlighted with chainmail and then the “sharp” edges are highlighted with Mithril Silver. With the piping I highlight Mechrite Red with Blood Red, Fenris Grey with Hawk Turquoise and Caliban Green with Warpstone Glow. 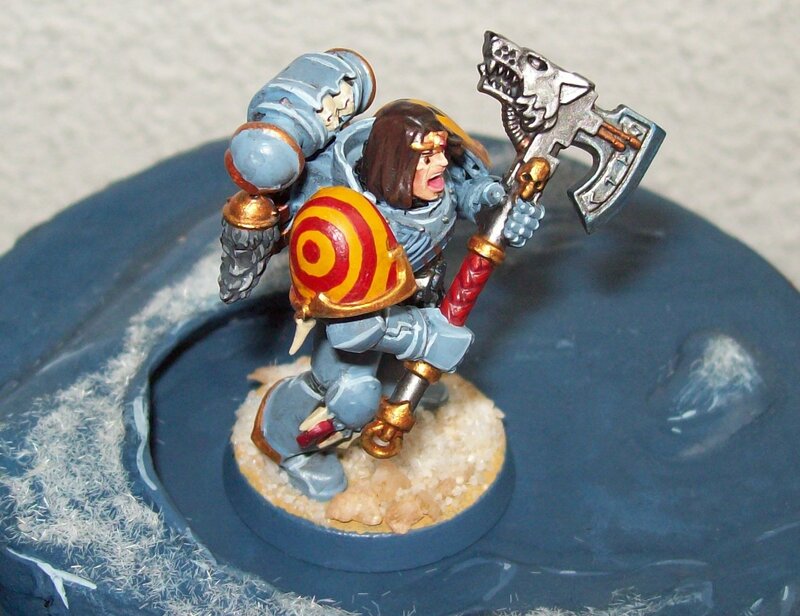 For the power axe I used a Guilliman Blue glaze before adding the sparks with Hawk Turquoise, Ice Blue and Space Wolves Grey. For the heat damage on the flamer I used Lamenters Yellow followed by a final coat of Gryphonne Sepia. I’ve separated hair and fur from the rest of the instruction as I tend to deviate a lot here from model to model. 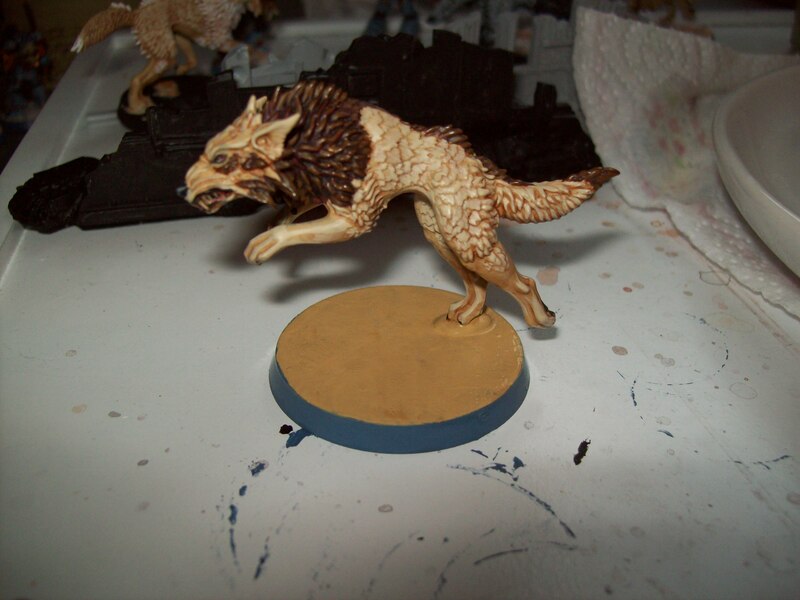 Start with the darkest colour and wash it, then highlight the spiky bits of the fur with the second colour. Use the final colour for extreme highlights. If you want to add patches of different coloured fur simply move one shade darker or lighter for the starting colour. I’m only showing one guy with hair here. The process I use is: base colour, wash, highlights. I start with a colour very close to the base colour and blend colours together until I get to a very light highlight colour. For Grey Hair I start with Codex Grey and work my way up to Skull White. 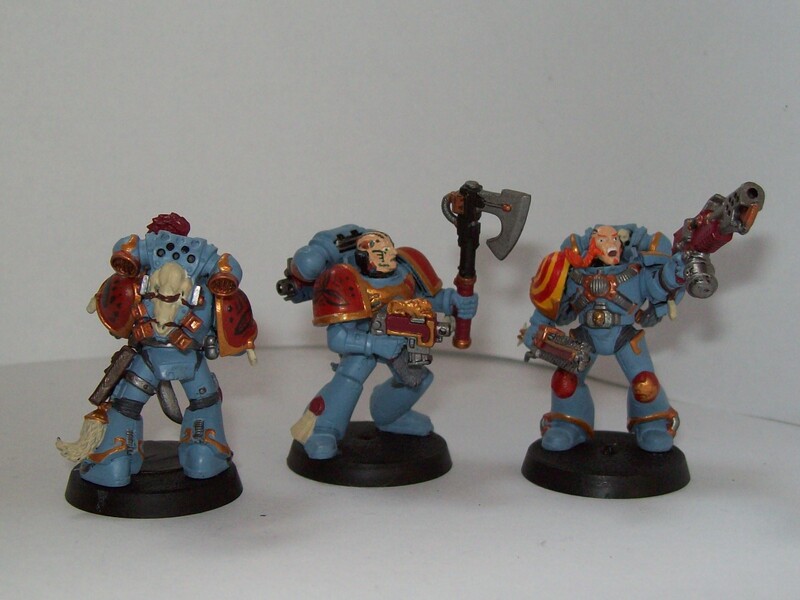 So, that’s how I paint Space Wolves. Sorry for the delay, I had camera problems. I just hope that this helps somebody! When the new Citadel Paints were introduced earlier this year I was quite excited about the glazes, and I actually find them quite useful. 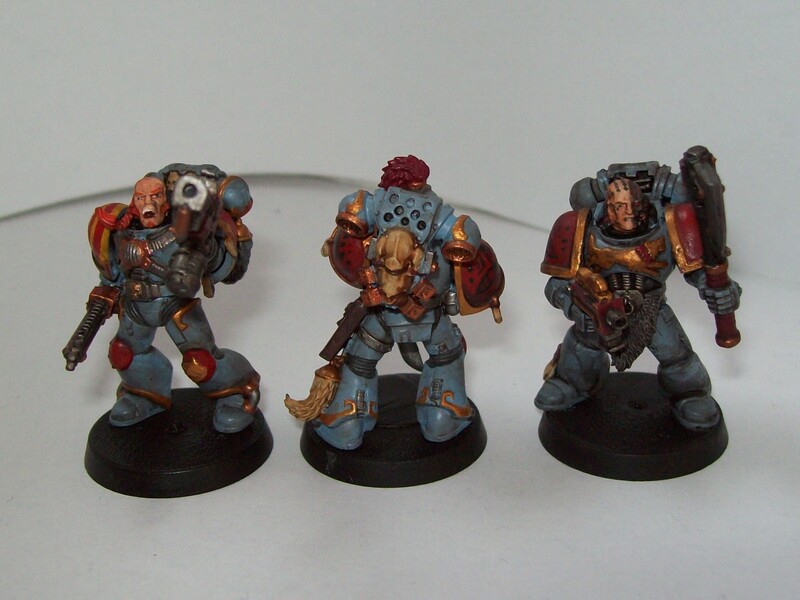 The glazes are very watery paints and come in four colours: Bloodletter (red), Lamenters Yellow (yellow), Waywatcher Green (green) and Guiliman Blue (blue). So far I’ve used them for lighting effects on metallic areas such as the power axe on this guy and the headlights on my Land Speeder and they work pretty well. The photos don’t do the effect justice as it is angle dependent, so as you move the glow does too. The other time that I have found them useful is when I’ve needed to soften highlights, which I used on the hilt of the sword on the scout below. I decided to try and do a systematic study on the glazes for a project. 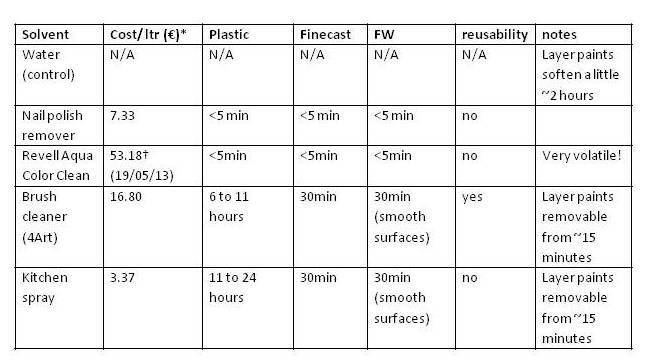 In the picture below you can see a chart of colours. I’m just using colours from my box, so some will be missing. For instance, neither me nor my boyfriend own many purples. First a note on the test. In order to try and make it fair I did it on a uniform flat surface which meant that the glazes pooled differently than they would on a model. 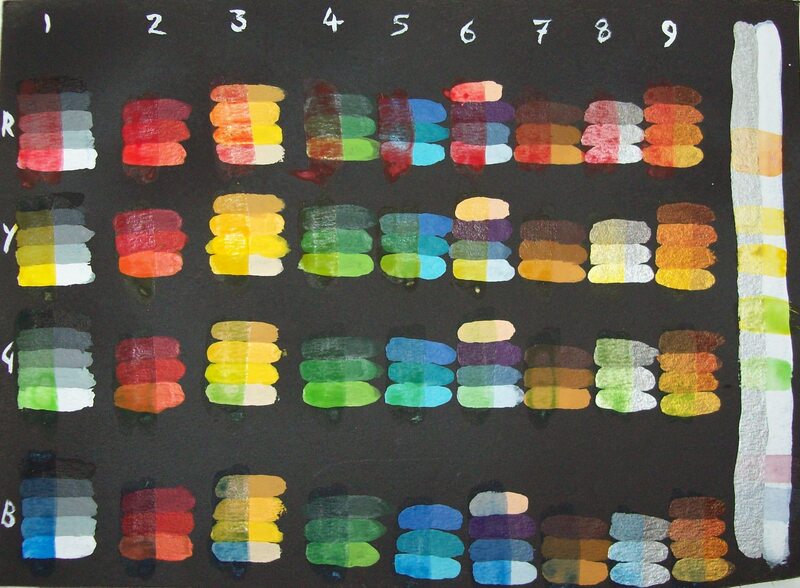 None of the test swatches looked as good as any of my less scientific try-outs of the glazes, however they are all equivalent, so I can compare them. They work particularly well on metallics. 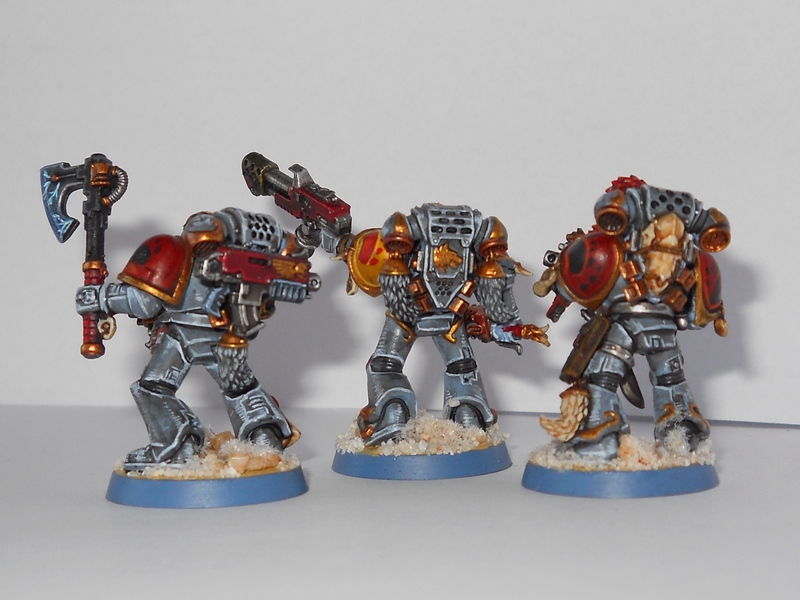 I actually really like the effect of the yellow glaze on metallics, it makes golds look really warm. The other colours look less good on gold. I don’t know what’s the matter with the Bloodletter, it doesn’t seem to have worked as well as the others. That is probably due to my painting rather than the glaze though, as all of the glazes look less good on the swatches than they do on models. The glazes tend to pool on surfaces and with a flat horizontal object, that’s exactly what they do- which is why it all looks a bit ugly! The glazes can also be mixed to create other colours, particularly oranges and purples. The long silver and white bar down the edge has examples of orange and purple (and a couple of streaks of yellow and green which are there by accident). So time to wrap this lot up. In conclusion the glazes are pretty useful and can be used to make some nice effects when used in conjunction with metallic paints. 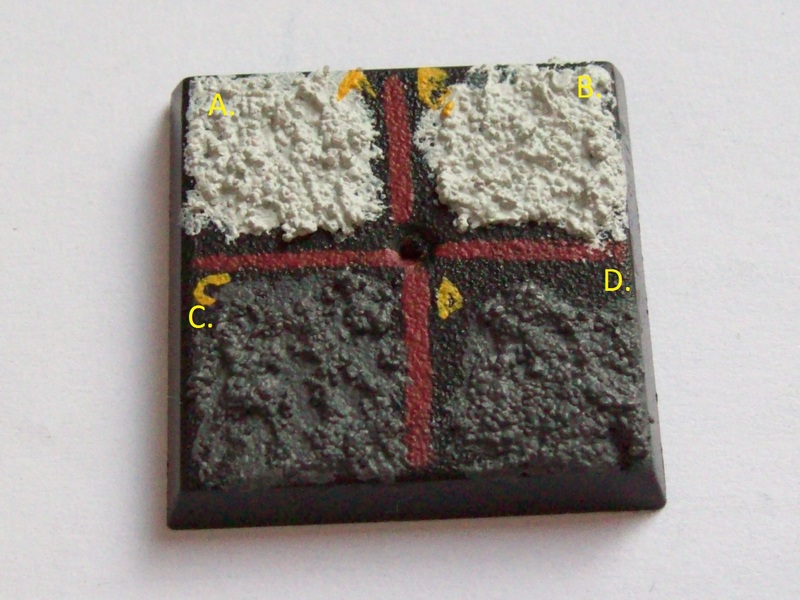 However, as they do change the shade of painted areas considerably, I’d really recommend doing a test piece first. I just thought that I’d talk about how I do my bases. It’s not the most complicated or the most spectacular method but it does the job. 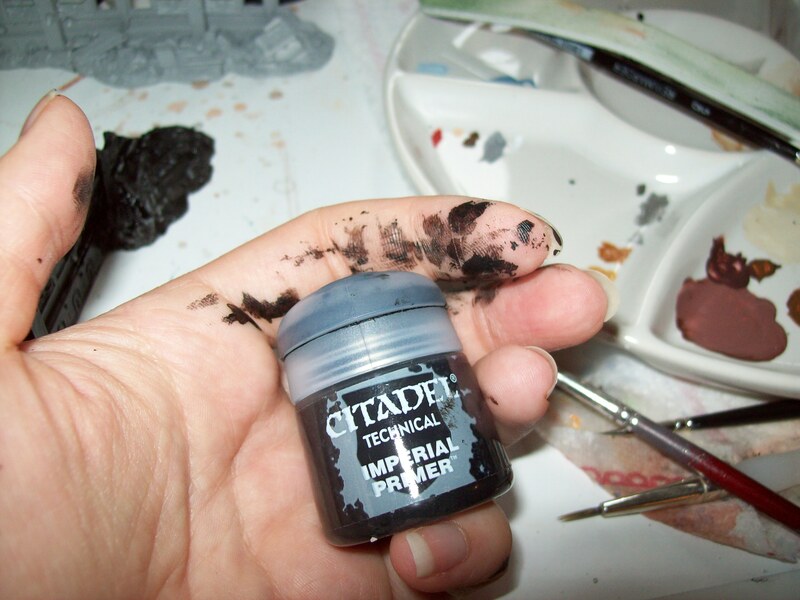 I’m still using the old Citadel Paints. The names of the equivalent new Citadel Paints are in brackets when the paint is first mentioned. I start by painting the top of the base with a 2:1 mixture of Bleached Bone (Ushabti Bone) to Tausept Ochre (Balor Brown) and the sides with Shadow Grey (The Fang). I then add rocks. For larger rocks (used very occasionally) I paint them first. 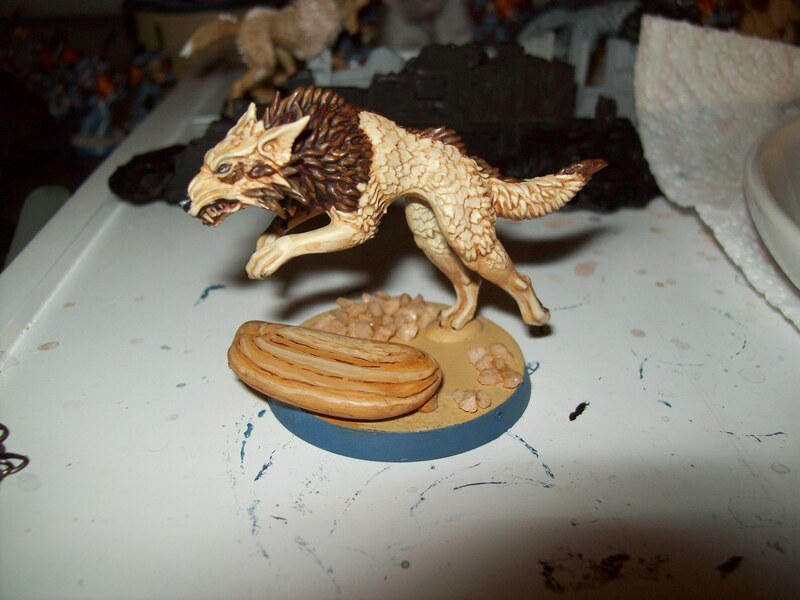 Here I used a Tausept Ochre base coat followed by a 1:1 mixture of Bleached Bone to Tausept Ochre. For the veins I used Bleached Bone, Tausept Ochre and Scorched Brown (Rinox Hide), before washing the rock with Gryphone Sepia (Seraphim Sepia). The smaller rocks came from a local chain store and were designed for flower arrangements. I just glue them on with superglue as they happen to match my basing colour scheme pretty much perfectly as they are (this is a total coincidence, honest!). I then apply PVA glue to the top surface apart from where it’s covered in rocks before dipping it in sand. 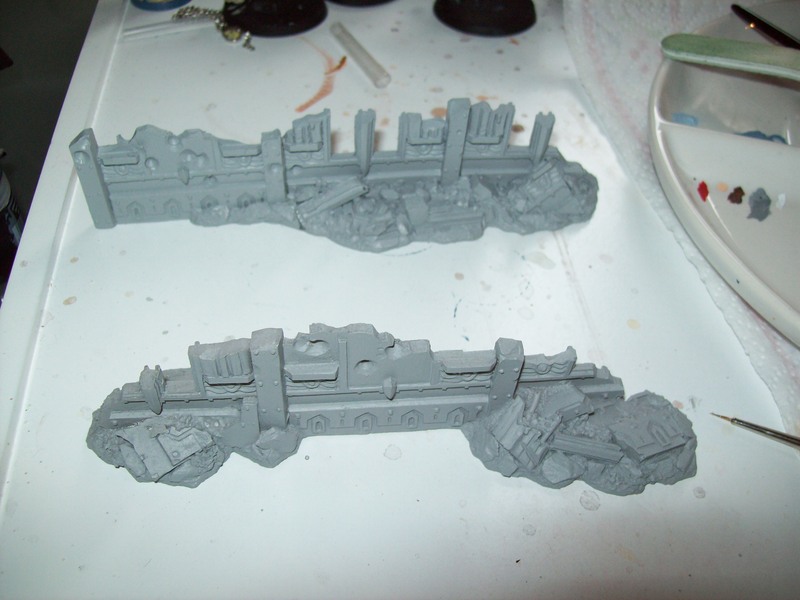 I wipe off any stray sand that is attached to the model or the rocks before leaving it to dry. 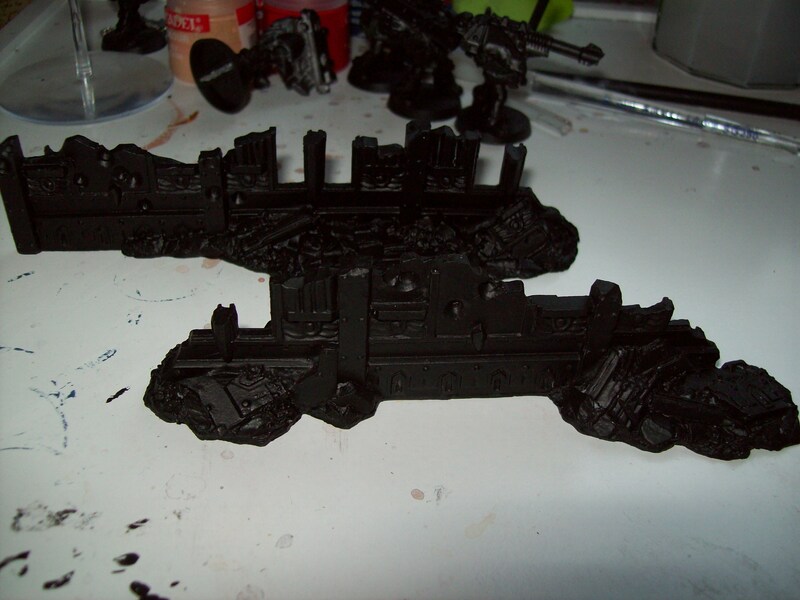 I then apply splodges of more PVA glue before dipping the base in Citadel Snow to get a patchy snow effect. I blow off any excess snow, taking care not to do it over the open tub after the first time I tried to base and ended up covering the table in fake snow, and leave the model to dry. To finish off I add a few drops of Baal Red (Carroburg Crimson) for blood and use Shining Gold (Gehenna’s Gold) to write the model’s name on the side. I like to think of Viking names for my figures and I use Wikipedia to get most of them. This site has some good wolf/dog names though. The whole process can be done very quickly, particularly when I set up a production line of models. There’s something incredibly satisfying about finishing a model by decorating the base, particularly as it’s a sign that it’s over and I can move on to something else!